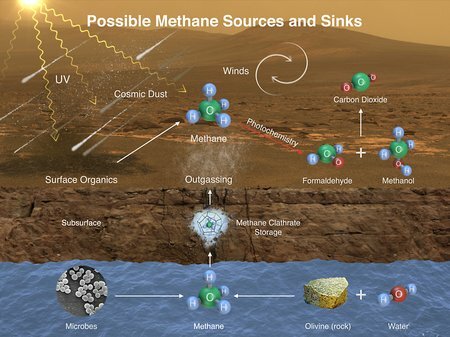 This image illustrates possible ways methane might be added to Mars’ atmosphere (sources) and removed from the atmosphere (sinks). NASA’s Curiosity Mars rover has detected fluctuations in methane concentration in the atmosphere, implying both types of activity occur on modern Mars. NASA’s Mars Curiosity rover has measured a tenfold spike in methane, an organic chemical, in the atmosphere around it and detected other organic molecules in a rock-powder sample collected by the robotic laboratory’s drill. 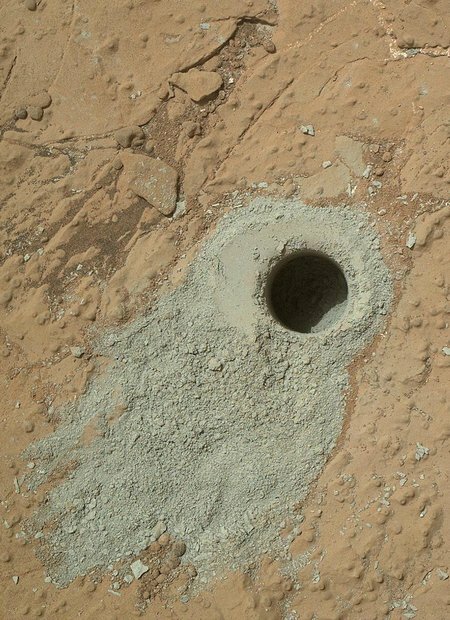 NASA’s Mars rover Curiosity drilled into this rock target, “Cumberland,” during the 279th Martian day, or sol, of the rover’s work on Mars (May 19, 2013) and collected a powdered sample of material from the rock’s interior. This graphic shows the Tunable Laser Spectrometer, one of the tools within the Sample Analysis at Mars laboratory on NASA’s Curiosity Mars rover. By measuring absorption of light at specific wavelengths, it measures concentrations of methane, carbon dioxide and water vapor in Mars’ atmosphere. 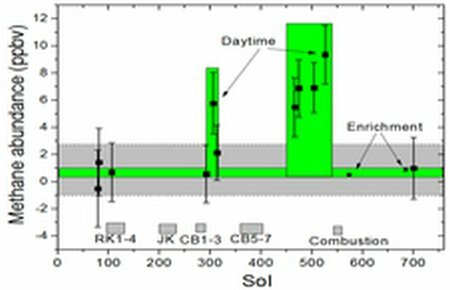 This graphic shows tenfold spiking in the abundance of methane in the Martian atmosphere surrounding NASA’s Curiosity Mars rover, as detected by a series of measurements made with the Tunable Laser Spectrometer instrument in the rover’s Sample Analysis at Mars laboratory suite. 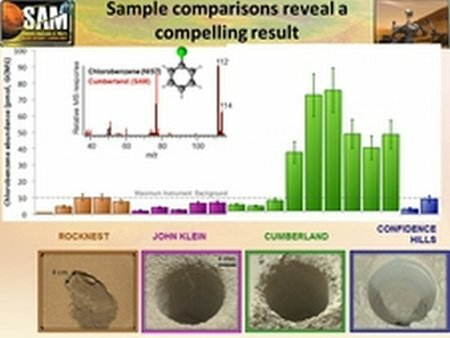 This graphic offers comparisons between the amount of an organic chemical named chlorobenzene detected in the “Cumberland” rock sample and amounts of it in samples from three other Martian surface targets analyzed by NASA’s Curiosity Mars rover. This illustration portrays some of the reasons why finding organic chemicals on Mars is challenging. Whatever organic chemicals may be produced on Mars or delivered to Mars face several possible modes of being transformed or destroyed. Researchers used Curiosity’s onboard Sample Analysis at Mars (SAM) laboratory a dozen times in a 20-month period to sniff methane in the atmosphere. During two of those months, in late 2013 and early 2014, four measurements averaged seven parts per billion. Before and after that, readings averaged only one-tenth that level. Curiosity also detected different Martian organic chemicals in powder drilled from a rock dubbed Cumberland, the first definitive detection of organics in surface materials of Mars. These Martian organics could either have formed on Mars or been delivered to Mars by meteorites. Organic molecules, which contain carbon and usually hydrogen, are chemical building blocks of life, although they can exist without the presence of life. Curiosity’s findings from analyzing samples of atmosphere and rock powder do not reveal whether Mars has ever harbored living microbes, but the findings do shed light on a chemically active modern Mars and on favorable conditions for life on ancient Mars. Researchers worked many months to determine whether any of the organic material detected in the Cumberland sample was truly Martian. Curiosity’s SAM lab detected in several samples some organic carbon compounds that were, in fact, transported from Earth inside the rover. However, extensive testing and analysis yielded confidence in the detection of Martian organics. 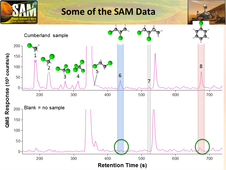 SAM analyzed hydrogen isotopes from water molecules that had been locked inside a rock sample for billions of years and were freed when SAM heated it, yielding information about the history of Martian water. The ratio of a heavier hydrogen isotope, deuterium, to the most common hydrogen isotope can provide a signature for comparison across different stages of a planet’s history. The ratio of deuterium to hydrogen has changed because the lighter hydrogen escapes from the upper atmosphere of Mars much more readily than heavier deuterium. In order to go back in time and see how the deuterium-to-hydrogen ratio in Martian water changed over time, researchers can look at the ratio in water in the current atmosphere and water trapped in rocks at different times in the planet’s history. Martian meteorites found on Earth also provide some information, but this record has gaps. No known Martian meteorites are even close to the same age as the rock studied on Mars, which formed about 3.9 billion to 4.6 billion years ago, according to Curiosity’s measurements. 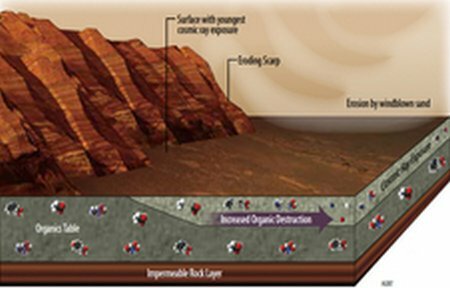 The ratio that Curiosity found in the Cumberland sample is about one-half the ratio in water vapor in today’s Martian atmosphere, suggesting much of the planet’s water loss occurred since that rock formed. However, the measured ratio is about three times higher than the ratio in the original water supply of Mars, based on assumption that supply had a ratio similar to that measured in Earth’s oceans. This suggests much of Mars’ original water was lost before the rock formed. Curiosity is one element of NASA’s ongoing Mars research and preparation for a human mission to Mars in the 2030s. Caltech manages the Jet Propulsion Laboratory in Pasadena, California, and JPL manages Curiosity rover science investigations for NASA’s Science Mission Directorate in Washington. The SAM investigation is led by Paul Mahaffy of Goddard. 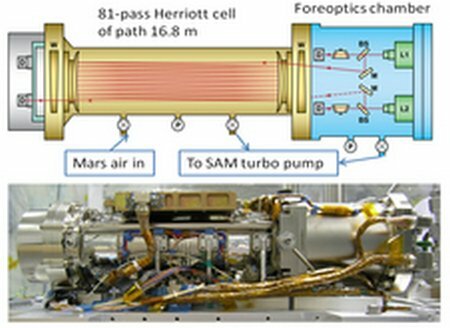 Two of SAM instruments key in these discoveries are the Quadrupole Mass Spectrometer, developed at Goddard, and the Tunable Laser Spectrometer, developed at JPL. The results of the Curiosity rover investigation into methane detection and the Martian organics in an ancient rock were discussed at a news briefing Tuesday at the American Geophysical Union’s convention in San Francisco. The methane results are described in a paper published online this week in the journal Science by NASA scientist Chris Webster of JPL, and co-authors.